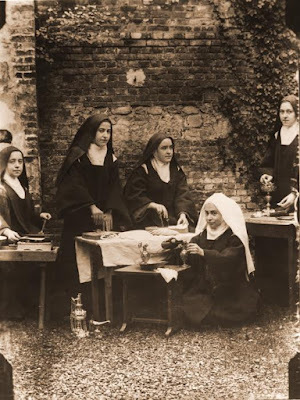 This, of course, is much in keeping with the usual customs of women’s monasteries, where the sisters perform many of the tasks that would otherwise be assigned to clerics, such as leading the entire Divine Office and chanting its readings and prayers; making the responses at low Mass from outside the sanctuary in situations where no servers are available; and, in some rare cases, chanting the epistle at Mass (see Shawn Tribe’s “Carthusian Nuns and the Use of the Maniple and Stole”). 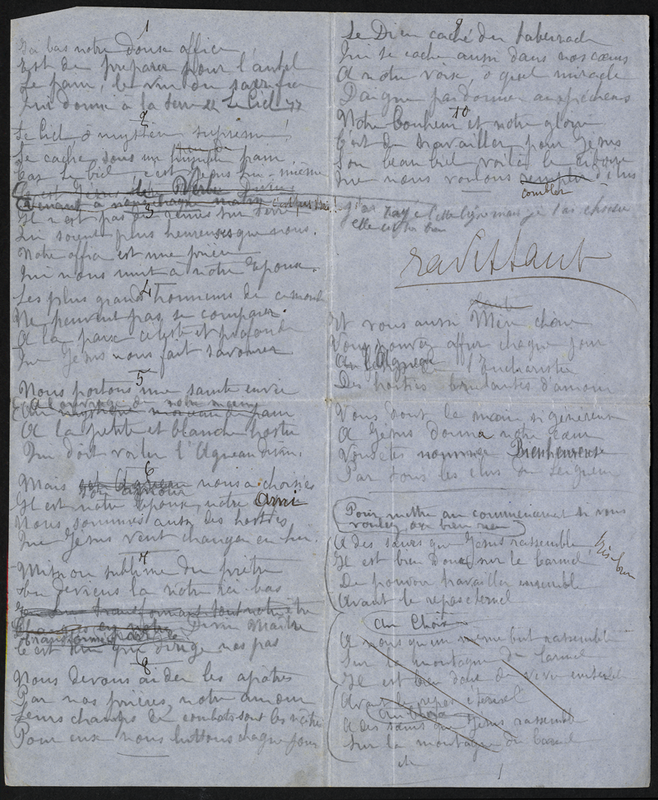 St. Thérèse was a gifted amateur poet and playwright who composed a surprising amount of literary work in her spare moments during her nine years as a Carmelite nun. Some of her work was intended for public occasions such as recreations, birthdays, and feastdays, while other pieces were more private, sent to one or a few of her religious sisters. 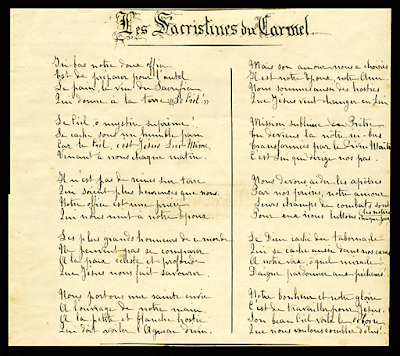 In the same month of November 1896, she wrote a poem called “The Sacristans of Carmel,” in rhyming octosyllabic verse, which I wish to share with readers in honor of the Little Flower’s feast (whether you are celebrating it today on the new calendar or two days from now on the old calendar). 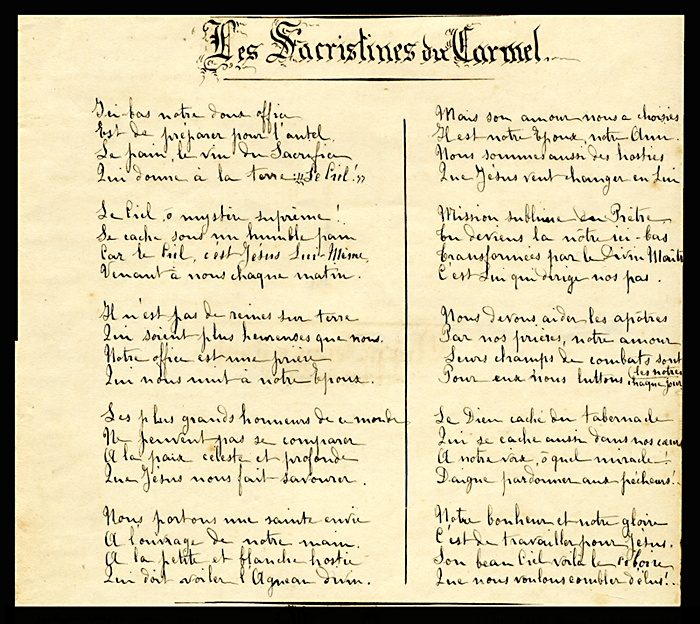 The poem was written for Sr. Marie Philomena, who had asked Thérèse for something she could sing while baking; but it was first read by her aunt. Later, all of the sacristans and altar bread bakers got to know the poem, and apparently sang it regularly in their work, to whatever familiar tune they chose that would match the meter. In this we see a splendid example of the genre of a “work song” that has nearly disappeared from the world of mass-marketed and passively consumed entertainment. One may hope such work songs still survive in the Carmels. Coming to us each morning. Who are happier than we. Which unites us to our Spouse. Which Jesus lets us savor. Which is to veil our divine Lamb. 6. But his love has chosen us. He is our Spouse, our Friend. Which Jesus wants to change into Himself. You become our mission here below. It is He who guides our steps. By our prayers, our love. For them we fight each day. Is to work for Jesus. Here she [Thérèse] sings of her concrete way of sharing immediately in the “sublime mission of the Priest.” “Transformed” into Jesus by the Eucharist, “changed” into Him, does she not then also become an “alter Christus”…? She cannot leave her cloister to “preach the Gospel,” but Jesus, the first Missionary, walks in her and through her. He “guides her steps,” as He does those of the apostles she prays for, loves, and struggles for. She cannot absolve from sins. But Jesus present in her through the Eucharist gives her a share in his ministry of reconciling sinners. In fact, if we may use the awkward expression “holy envy,” it will always be the case that each Christian vocation has reason to admire the goods of every other, since these goods are not, simply speaking, compatible with one another. The priest may well “envy” the female religious her total and silent dedication to prayer, which he will almost never attain in his active ministry; the married man or woman may “envy” the consecrated soul its undivided attentiveness or availability for the things of the Lord (cf. 1 Cor 7); the consecrated man or woman may “envy” the married their sacramental realization of the faithful, fruitful union of Christ and the Church, which brings new immortal souls into the world, to complete the number of the elect. In the Mother of God alone do we find united that which nature cannot unite, combining and exceeding all Christian states of life: she is the wife unwed, the child-bearing virgin, mother inviolate, mediatrix of all grace as the inseparable minister of the High Priest. In her all vocations are at one, like white light before it splinters into a spectrum of colors. For the rest of us, the individual colors are distinct, complementary, and beautiful, as they are intended to be, for our individual benefit and for the common good of the Church. 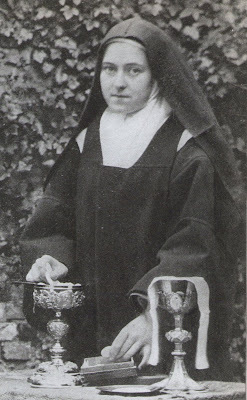 St. Thérèse’s poem serves as a profitable meditation on several intertwined mysteries: the unique, exalted, and irreplaceable nature of the ministerial priesthood; the lofty participation in Christ the High Priest enjoyed by all who are baptized into His sacerdotal and royal dignity; the special position of consecrated religious, who follow the priestly and sacrificial Lamb whithersoever He goeth; and the value in God’s sight of the quiet, humble work done by sacristans whenever they reverently prepare the materials and environs required for worthily offering the sacrifice of praise. For this and other details, I am indebted to the excellent commentary in The Poetry of Saint Thérèse of Lisieux, trans. Donald Kinney, OCD (Washington, DC: ICS Publications, 1996), 169–70. 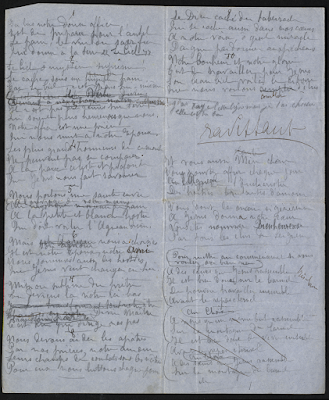 The translation is found in Kinney, Poetry, 170–71, as well as at this website. The French is contained in Kinney, pp. 301–302.